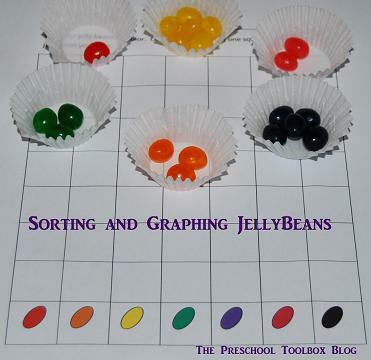 5 Jelly Bean Math Activities for Preschool and Kindergarten! With Easter just around the corner, the Jelly Bean Math Activities below are fun ways to play and learn in Preschool and Kindergarten! It’s amazing to see what learning opportunities can be explored with just a few colorful jellybeans! Materials needed: One Jellybean Graph (linked above) for each child, small plastic bags or containers, jellybeans, and markers or crayons. Print a copy of the graph for all of your children. Have a bag of jellybeans (standard colors/black) prepared for each child so there are different amounts of each color jellybean. Invite the children to sort their jellybeans according to color. Once sorted, the children can graph the numbers of each jellybean group. 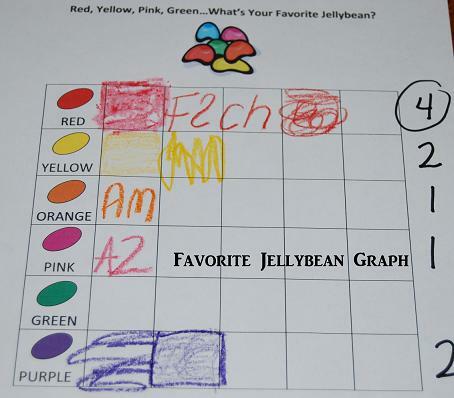 The children can color one square for each jellybean they have above the corresponding colored jellybean on the graph. Materials needed: One Jelly Bean Patterning page (linked above) for each child and markers/crayons (or real jellybeans as in the photo above). Print the file for each of the children. In each row a pattern is started. Invite the children to use markers, crayons, or real jellybeans to finish the pattern in each of the jellybean rows. Invite the children to determine what pattern is used in each of the rows (for example: in row one an ABC pattern is used with A=RED, B=GREEN, and C=YELLOW). If desired, small pompoms or jellybeans can be used as manipulatives to practice the patterns shown in each of the rows on the patterning page after the children finish. Older children may wish to create more complex patterns than those provided on the patterning page. 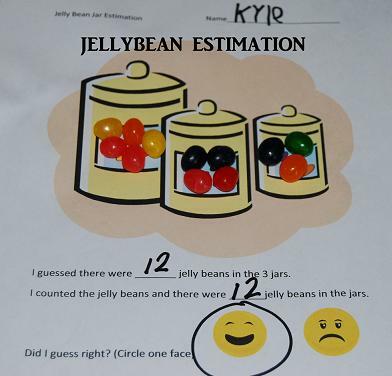 Materials needed: Jelly_Bean_Jar_Estimation page (linked above), jellybeans, and pencils, crayons, or markers. Print the estimation page for each of the children. Invite the children take a “good guess” at how many jelly beans are in the jars on the worksheet. The children can write or stamp their guess on the line provided. Note – Younger children may need help with making good guesses. Working with young children on subitizing skills can greatly enhance estimation skills! Count the number of jelly beans in the 3 jars together as a group (or individually). The children can write the total number of jelly beans on the line provided. 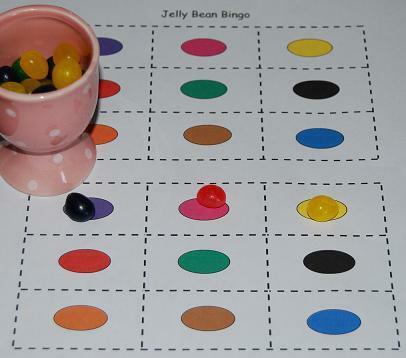 Materials needed: One bingo game (file linked above) per child and 9 colors of jellybeans (purple, pink, yellow, red, green, black, orange, brown, and blue – enough for each child to have ONE of each color. Prior to the game: Print as many copies of the boards as needed for home or classroom use. Cut out the individual boards and laminate for durability. To begin, have an adult call out the colors (one at a time) that correspond to the colors on the game boards. 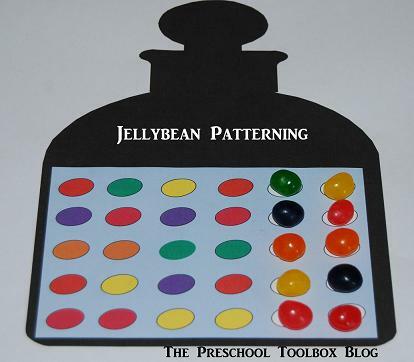 Invite the children to touch the jellybeans on their game boards as the colors are called out. Practice several times until the children are familiar with all of the colors on the game board. Next, call out the colors (one at a time) and have the children place a jellybean of the same color on the square that matches. The game is over when all the colors on the the game board are covered. Make a center with the game boards and jellybeans so the children can practice calling out the colors for their peers. The bingo game can also be played with pompoms if preferred. Now, time to enjoy the jelly beans! What color of Jelly Beans do your children like best? Print the Jelly Bean Graph (Favorite_Jelly_Beans.pdf linked above) and ask the children what color of jelly bean they like best. Record the favorites (each child can color one square or stamp/write the initials of their name in the square) on the graph. Count the number of “likes” for each color of jellybean to determine which jellybean is the favorite or least favorite. We hope your children enjoy playing and learning with JELLYBEANS! For MORE Easter fun and learning, the entire Easter Theme for Preschool and Kindergarten is now available for download here on the blog! « Easter Themed Activities for Learning and Play in Preschool! 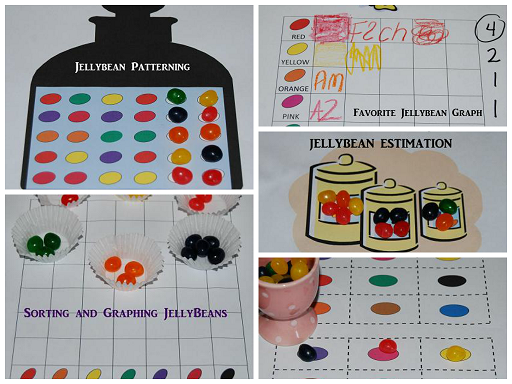 I’m loving this colorful roundup of jelly bean learning activities. Perfect for Easter!! Malia – I should check blog comments more often! I write tutorial content, so I usually don’t get many:). TY for taking your time to view the post and leave a comment! It is appreciated!